apoptosis, necrosis, and autophagy. 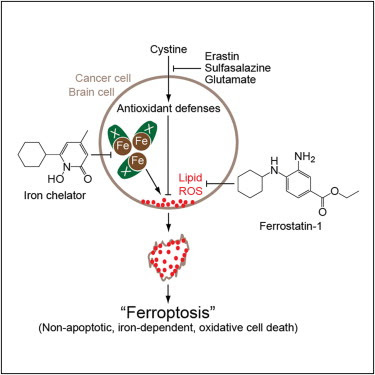 Erastin inhibits cystine uptake by the cystine/glutamate antiporter, creating a void in the antioxidant defenses of the cell and ultimately leading to iron-dependent, oxidative death. Thus, activation of ferroptosis results in the nonapoptotic destruction of certain cancer cells.